Wash the leaves carefully and cut off any hard stems. Bring a large pot of water to the boil, add some salt and after that the spinach leaves. Boil them for a few minutes until they start turning soft (for the spinach about 2 minutes should be enough). Once the leaves have turned soft, drain them in a colander and run cold water over them. Toss the cooked leaves and check if they are cold. Wait a few minutes allowing the water to drain from the leaves. Squeeze out very well the remaining liquid with your hands. You can now roughly chop the boiled spinach leaves. Now combine all the filling ingredients together, adjusting the seasoning to your liking. Roll out one puff pastry on a floured surface and cut a circle large enough to to fit a 24 cm spring form cake tin with a little of the pastry overflowing the edge. Line the baking tin with a sheet of baking paper. Next line the pastry inside the tin pressing gently to all the edges. Roll out the remaining pastry on the floured surface, cut a ring large enough so it is sufficient enough to cover the tin but not bigger than that. 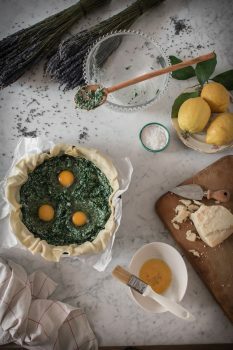 Fill the pastry case with the cheese filling, even out the surface and with the back of a tablespoon form three small “caves” large enough to fit one egg each. Fit the remaining pastry circle on top and press gently. Once that is done, brush the top of the pie with the whisked egg. With a sharp knife make a few incisions on the top of the pie to allow the steam to escape. Bake in the preheated oven at 180 C for about 40-45 minutes until the top is golden brown and the filling is baked through. Take the pie from the oven and leave to cool for about 15 minutes before serving.